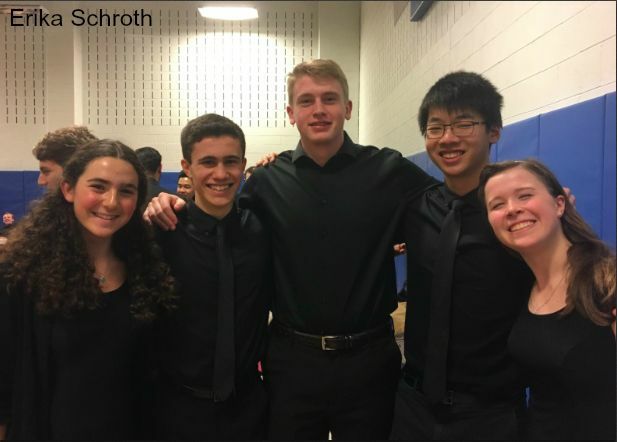 In the photo above, Lily Meyers ’20, Kieran Anderson ’18, Owen Rahr ’18, Kenny Lu ’19, and Katie Broun ’19 (L-R), represent Hopkins at CMEA regionals as members of the mixed choir. On Saturday, January 13, twenty-eight Hopkins instrumentalists and vocalists participated in this year’s Connecticut Music Educators Association (CMEA) Southern Regional Festival. This is the largest group that Hopkins has ever sent to Regionals. High-school musicians prepared a piece selected by CMEA, auditioned in November 2017, and were chosen to participate in a two-day festival and concert in January 2018. At the concert, the twenty-eight Hilltoppers represented the Hopkins music program in the treble choir, mixed choir, band, and orchestra.